This article will discuss about some interesting Facts about the Florida Everglades which are related to the Florida Everglades. Florida Everglades are a natural area of topical wetlands in the southern portion of the U.S. state of Florida, comprising the southern half of a large watershed. It is shaped by water and fire. Below are the following facts about the Florida Everglades. The first record of this term was on Spanish named “Laguna del Espíritu Santo (“Lake of the Holy Spirit”). In 1773, the British surveyor John Gerard de Brahm named the area “River Glades”. While the term of “Everglades” first noted in a map in 1823. This large marshland ecosystem was created through the suitable geology of South Florida. At the same time, a warm, wet and subtropical climate supports the conditions of this ecosystem. The primary feature of the Everglades is the saw grass marsh. 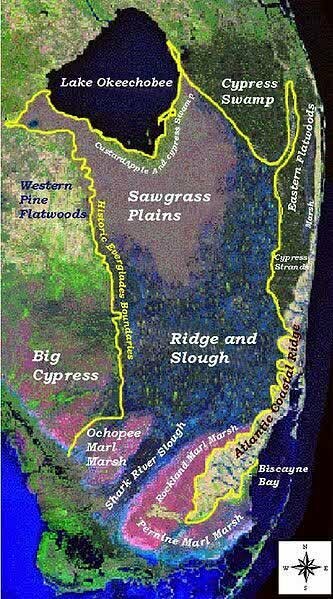 There are five geologic formations form the southern portion of Florida: the Tamiami Formation, Caloosahatchee Formation, Anastasia Formation, Miami Limestone (or Miami Oolite), and the Fort Thompson Formation. The Miami Limestone and the Fort Thompson Formation are the most influence in making up the region. Dry season and rainy season are the two basic seasons in the South of Florida. Dry season (winter) happens from November through April, while Wet season occurs from May through October. The averages of annual rainfall approximately 62 inches (160 cm) and the annual range of temperatures is less than 20 F.
Evapotranspiration is the sum of evaporation and plant transpiration from the Earth’s land surface to atmosphere. It is responsible for approximately 70–90 percent of water entering undeveloped wetland regions in the Everglades. In the wide areas of Everglades, three planes have crashed near it. Those are Northwest Orient Airlines Flight 705, Eastern Air Lines Flight 401 and ValuJet Airlines Flight 592. South Florida is especially vulnerable to invasive species, or species of plants and animals that adapt aggressively to conditions in the Everglades, allowing them to reproduce faster and grow larger than they would naturally in their native environments. Melaleuca tree is one of the 1,392 exotic plant species found in the Everglades. It takes water in greater amounts than other trees. It grows taller and more densely in the Everglades than in their native Australia, making them unsuitable as nesting areas for birds with wide wingspans.